For about the next four weeks or so we'll be bringing you the Unwine'd Friday Find, or an under $20 wine from one of the 100 Oregon wineries pouring at the Unwine'd Celebrate Oregon Wine event on April 29th. In fact, we're giving away tickets to the event and you can learn more about that contest by heading over to our Facebook page. The Unwine'd event is Oregon's biggest consumer tasting event ever and will be hosted at the Left Bank Annex just across the bridge from downtown Portland on, believe it or not the left bank of the Willamette. The event will of course be about wine tasting, and not just Pinot Noir folks, but it offers guests an opportunity to explore the varied bounty of Oregon from the Walla Walla Valley, yes, in Oregon to the Rogue Valley at the state's southern end. In addition to the variety of wines, there will be food served up by some of the best culinarians that PDX and the Willamette Valley have to offer. From the legendary Joel Palmer House to Portland's Park Kitchen and the gem of the Columbia Gorge, Nora's Table. Oh and all the wines being poured, they'll also be for sale. In addition to the wine and food there will be two educational components, an Oregon versus the World Pinot Noir tasting and a seminar on Oregon's white wines, which brings us to today's Friday Find. Brooks Winery will be pouring their wines at Unwine'd and they have developed a fantastic reputation for the Riesling and Pinot Noir that they produce. A family winery with a compelling and heartfelt story Brooks produces wines in the Eola-Amity Hills AVA of the Willamette Valley. 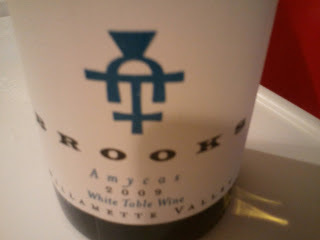 Today's find is their wicked cool white blend the Amycas. Amycas is a blend that certainly nods to Alsace with Pinot Blanc, Pinot Gris, Gewurztraminer, Muscat and Riesling all in the mix. The wine offers up so many varied and complex aromatics it's dizzying. In fact, if there was a wine that you might just sit around and bury your nose in the glass, this is it. Floral aromatics mix with apricot, peach skin and green apple, there's an underlying tone of sweetness as well. The wine delivers as much fun when it comes to the palate as well. Loads of minerality, flavors of sweet hay and honey as well as melon and ripe apricots lead into a mouth-filling white wine with both supple roundness and a crisp finish. For $15 you've got yourself a beautiful food friendly wine or one to while away those long Northwest summer day, which will come eventually. Right? In any case get your Unwine'd tickets and just pretend.